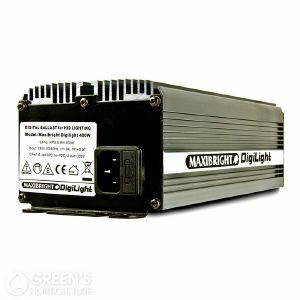 After several years of research and testing, Maxibright Digilight ballasts are now available to help prolong equipment lifespan and provide cool and quiet running. Instead of using a copper coil or magnetic resistance to ignite the lamps, digital ballasts use microprocessors that avoid the 6.2A ‘spike’ of ignition in compact ballasts. The ‘soft start’ of the Maxibright Digilight ballast ignites at 2.9A, which should increase lamp lifespan. Despite rumours – and hopes – to the contrary, digital ballasts will still use a similar amount of electricity as compact ballasts once running (digitals are slightly more efficient) and using digital ballasts will not increase your yield unless they draw more power and therefore cost more to run. However, they will run significantly cooler than compacts and therefore any decision to buy digital ballasts should be about improving the quality of your equipment rather than your plants.